A fabulous, recently converted barn in a quiet rural location set on the rolling Cornish hillside above the stunning Portholland Cove. Enjoy the silence from the attractive enclosed garden or sit and relax in the beautifully furnished and comfortable open plan living room. Take a stroll down the hill, across a stream onto the unspoilt traditional Cornish cove to experience a uniquely peaceful holiday. If you enjoy walking we have the spectacular Cornish Coastal path stretching east or west from which you can explore hidden sandy bays or walk to Portloe for a crab sandwich lunch before strolling back enjoying spectacular panoramic views from the cliff tops. A fabulous base also from which to explore the notoriously beautiful Roseland Peninsula with its winding maze of lanes with the flower filled hedgerows, attractive villages and the sandy beaches of Carne and Pendower. Hamish and Justine Ross arrived at Ventonveth in September 2013. Hamish is employed by Caerhays as the Farm Manager and Justine recently sold her residential lettings agency in Truro and now works for the estate looking after their holiday lets. Ventonveth had been rather neglected over the last few years and when we arrived the gardens were completely overgrown, fields just areas of weeds and the house in very poor condition. The barn was just a shell. Over the last year, we have worked hard to create a tranquil and beautiful setting for us and our holidaymakers and have renovated the barn to offer comfortable and beautifully presented holiday accommodation with a separate garden area. The whole project of Ventonveth is on-going and we hope our holiday clients will return again over the years to watch it grow and mature. Comfortable open plan living area with dining area, sofa and two chairs, coffee table and TV, freesat box, DVD player, and a selection of books, DVD's and games. There is also wi-fi connection. Notes on accommodation: Ventonveth Barn is a wonderful holiday location for those wanting a quiet and relaxing holiday. It is ideal for couples on a romantic break or those with children wanting a cove with sand and rock pools on the doorstep. Being situated in such a beautiful part on the Rosaland Peninsula it is the perfect getaway. Due to it being a farm setting with stock and working dogs, we prefer no pets. Outside: The farm is accessed by an unmade farm lane. The barn lies in the heart of the steading and the owner's gardens but has its own private garden. There is a paved terrace with table and chairs and a lawned area surrounded by beds with a rotary dryer. The gardens are south facing and are exceedingly sunny and look across the rolling Cornish countryside. Utility Room: Separate utility/washing room in nearby dairy with washing machine, small freezer and rail to hang wetsuits. Cleaning / Towels / Linen / Maid service: High quality bed linen and bedding, - fresh linen provided for stays of more than one week. Bath towels provided but please bring your own beach towels. The cottage was lovely. Very easy to stay in, clean and well equipped. The hosts are very friendly and accommodating. 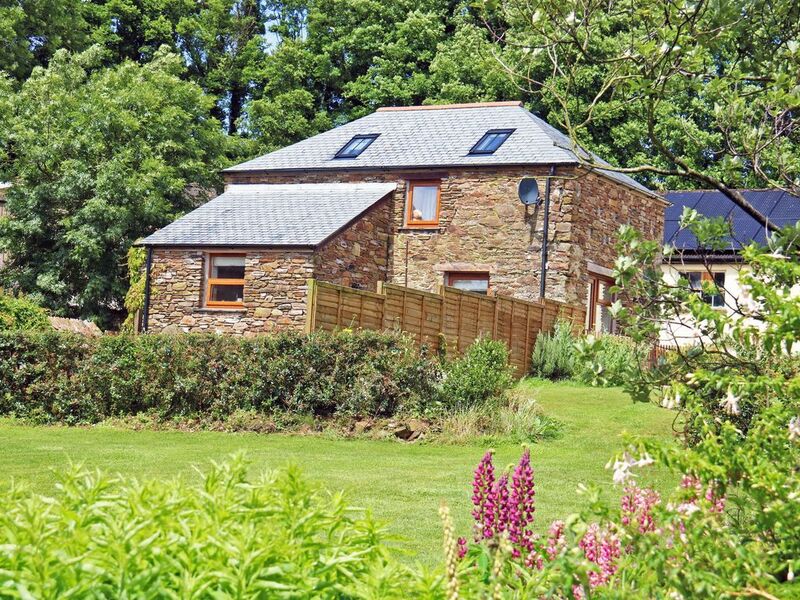 The location is beautiful, with access to the farm (including new born animals), beautiful scenery and easy access to lots of gorgeous beaches and other attractions of Cornwall. The converted barn was immaculate on our arrival and had everything we needed in it for a comfortable stay. It felt light and airy. There was a lot of attention to detail. The manual for the property is the best I've ever seen. Fantastic info in it with photos and maps about local walks, restaurants, activities etc. The location was lovely - definitely off the beaten track - although not hard to find with Justine's great directions. The barn is part of a proper working farm with tractors, quad bikes, calves in another barn and sheep in the surrounding fields. Our boys loved that - and especially the friendly dogs too. It was very quiet there - far enough from even the nearest little lane to hear any cars - not that there are many of those around - not in February anyway. It was nice to not even hear distant road noise. We arrived at night and totally missed the fact that we were driving right next to the sea just before getting to the barn. The next morning when we went out to explore we realised to our delight quite how close we were to the sea. The nearest little beach in Port Holland is easily walkable from the barn. We loved the Caerhay estate which is only a couple of miles away. This has a beautiful castle with lovely gardens plus a really nice beach. We spent most of one day here. There is a beach cafe which was a lot nicer than the reviews I read online - plus there is a good old fashioned tea room in the castle. The Eden Project was a straight forward drive from the barn. Our 9 and 6 year old boys liked it - but personally, I would have preferred to have spent the time exploring more of the real outdoor world of Cornwall which is spectacular enough. The Eden Project, I guess, is a good to fall back on if the weather is lousy - but we had good weather. Portloe, a couple of miles west of Port Holland, is a lovely, tiny little fishing village. There is a very cool hotel called Luggers right next to the water at which we ate a really nice lunch. We only had 3 nights here which was not enough. We would love to come back another time. On the day we were leaving, our boys ended up playing with 3 of Justine's grandkids, who were visiting and it was hard for us to tear them away from the farm. It was like a scene from a Enid Blyton 'Famous Five' book. Very warm and cozy, idyllic views and true relaxation! I'm Maya and we stayed in The Barn for four days with my family. We were really wonderful, the hosts made sure we had everything to feel like home. There was a fully equipped kitchen even with the smallest details. It was wonderful that we received compliments from the wine and biscuits hosts as well as a welcome card. It was really an amazing holiday. Thank you! This is my second stay in a relatively short period of time. It is a beautiful cottage and really comfortable. Everything is super clean, both beds are really comfortable and everything works great. A really great spot. Would highly recommend. Had a wonderful stay .. it was very comfortable and literally a home from home experience. Justine made sure we were settled and was very helpful. Would definitely recommend a,stay here. We loved staying in this well equipped cottage set in bucolic farmland. Justine provided thoughtful extras and left us in peace. We loved exploring the area. It was perfect! The local beach of West Portholland is exactly one mile via the lane but there is a shorter route across the fields and a small stream. Portholland comprises two small hamlets (East and West), each with a cove which at low tide are joined by a large expanse of golden sand. The beautiful beaches of Carne to the west and Porthlune to the east are a short car journey away, each with golden sands and great fun for swimming and if the waves allow, bodyboarding. For Trains and coaches both Truro and St Austell are equi-distant from Ventonveth, each about 10 miles away (20 minute drive). Veryan is the nearest village which is a five minute drive. Mevagissey is a 15 minute drive, whilst St Mawes is about 10 miles and from where there is a passenger ferry to Falmouth. Truro and St Austell are both 10 miles. Caerhays Castle is a five minute drive. There is a garage about one mile away which has a small convenient store. Village shops can be found at Veryan and Tregony for general supplies whilst Truro and St Austell have a wealth of shops, restaurants and supermarkets. There are a wide variety of pubs and restaurants across the Roseland Peninsula. Gardens like Caerhays and Heligan are close by as are a number of small picturesque harbour villages like Portloe, Portscatho and Mevagissey. Booking Notes: E-mail for further information and booking form. Changeover Day: Saturday is our preferred changeover day but we can be flexible out of peak season. Notes on prices: Our prices are inclusive of all utility costs. Linen.